Awarded with the 2008 Green Flag Agriculture for being the first farm to have brought out the extra-virgin olive oil single variety, now available in 10 different varieties. Thanks to the high - farms most resistant to the fly attacks is produced Bio Villa Carmine, an extra-virgin olive oil obtained through Organic Farming. Villa Carmine Company produces the “Flower of Tear”, the flower of the extra-virgin olive oil, obtained from natural blooming without any type of pressing. Villa Carmine Company produces D.O.P. Collina di Brindisi, an extra-virgin olive oil obtained according to the criterions fixed in the disciplinary of DOP "Collina di Brindisi". Extra-Virgin Olive Oil produced through milling of a mix of 10 olive farm varieties. Extra-Virgin Olive Oil obtained with the milling of olives of a single cultivar, capable to exalt the singular characteristics of every olive variety: produced in 10 versions. Available only in the format: bottle of 500 ml or in the package of 8 pieces. Extra-Virgin Olive Oil, called "Flower of Tear", is the flower of the oil called "Tear", obtained exclusively from natural blooming during the process of braking. Available in the format: bottle of 250 ml or in the package of 9 pieces. Extra-Virgin Olive Oil with Denomination of Protected Origin, produced according to the criterions fixed in the disciplinary of the DOP Collina di Brindisi. Available in the format: bottle of 500 ml or in the package of 8 pieces. The people who will effect orders superior to Euro 100 they will receive in gift a bottle of 250 ml of "Flower of Tear". 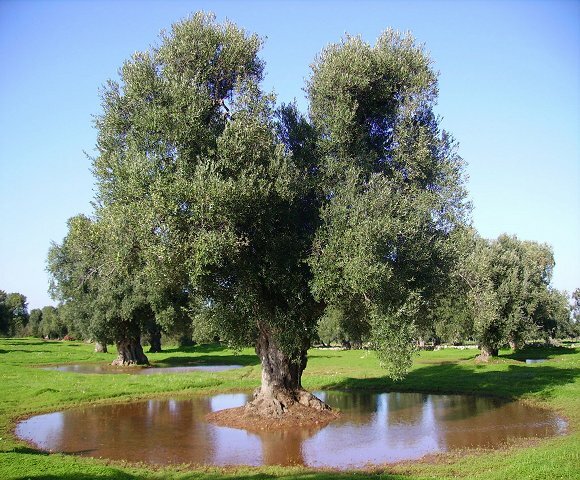 The most greater part of the oil production of the agricultural farm "Villa Carmine" it's represented by the Extra-Virgin Olive Oil "Green Gold", obtained from the grinding of all the varieties of olives, and available in numerous formats.